Johns Hopkins Home Care Group (JHHCG) is a full-service home care provider. They are owned and operated by Johns Hopkins Health System and Johns Hopkins University and have been servicing Maryland since 1983. 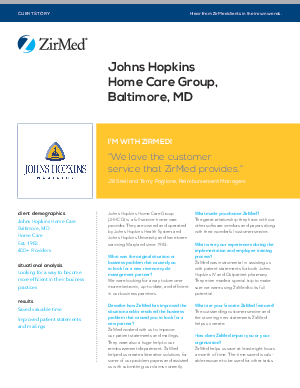 Learn how ZirMed made Johns Hopkins Home Care Group more efficient.